"Burnaby - 4990 Canada Way"
35 records – page 1 of 1. Photograph is a portrait of a woman identified as Charlotte Vidal, sitting on steps leading to Bernard Hill's house. 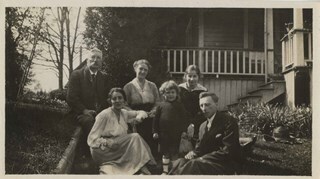 Note in pencil on the album page photograph reads: "Charlotte Vidal at B Hill's House, Burnaby"
Stamp on back reads: "Gepruft / 42 / Gef.-Lager / ...."
Photograph is a portrait of two men, three women and a boy identified from left to right as Bernard Hill, Maude Hill, Marian Hill, Ken Hill, Charlotte Vidal and Claude Hill sitting on steps leading to Bernard Hill's house. Note in pencil on the album page reads: "Charlotte Vidal at B Hill's House, Burnaby"
Photograph is a portrait of a boy and a woman identified as Ken Hill and Marian Hill in front of Bernard Hill's house. Note in pencil on the album page reads: "Charlotte Vidal at B Hill's House, Burnaby / Maude Hill, Ken"
Note in blue pen on verso reads: "Mama & Ken"
Photograph is a portrait of a man, four women, and a boy identified from left to right as Bernard Hill, Charlotte Vidal, Kitty Hill, Ken Hill, Maude Hill and Marian Hill. Note in pencil on the album page reads: "Charlotte Vidal at B Hill's House, Burnaby / Papa Hill, Charlotte Vidal, Kitty, Ken, Maude Hill, Mama Hill"
Note in blue pen on verso reads: "Mamma / Aunt Maude / Aunt Kitty / Mom / Pappa / Ken"
Photograph of the Burnaby Winter Club at 4990 Canada Way. 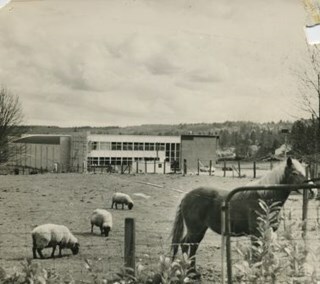 Three sheep and a horse are standing in a field by a building. Photograph of Hill family members taken at the Bernard Hill farm. Identified: Bernard R. Hill (on right). Photograph of English remittance men who worked on the farms of the Hill brothers, standing on the porch of the Bernard R. Hill house. 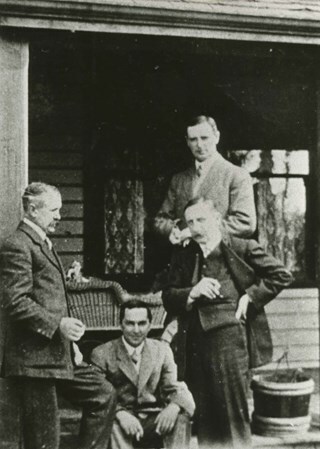 Photograph of Bernard Hill (centre) and Gerry Hill (right) on the Bernard Hill family veranda. The three women are unidentified. 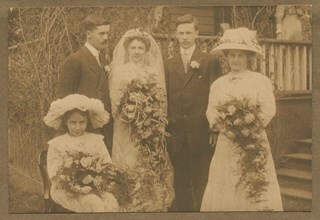 Photograph taken of the wedding party showing (l to r, standing): Arthur Rowe, Winnie Hill Rowe, Trevor Rowe, and Miss Lister. Kitty Hill, the flower girl, is seated. Winnie Rowe was the daughter of Bernard R. Hill who, with his brother L. Claude Hill, was an early settler of the Burnaby Lake area. The flower girl, Kitty Hill, was Claude's daughter. This photograph may have been taken in front of Bernard Hill's home on Douglas Road. 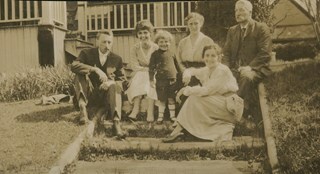 Photograph of members of the Hill family of Burnaby Lake. Left to right (standing): Kitty Hill (daughter of L. Claude Hill and niece of Bernard R.), A. Claude Hill (son of Bernard R. Hill), and Mr. A.D. Sever (seated on railing). 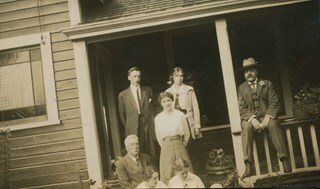 Seated on back step are Mr. Bernard R. Hill and his daughter, Winnie Hill. Seated on the front step are (left) Marion Hill (wife of A. Claude) and Marian Hill (wife of Bernard R.). This photograph was most likely taken at the home of Bernard Hill. Photograph of members of the Hill family of Burnaby Lake. Left to right (standing): A. Claude Hill (son of Bernard R. Hill), Marion Hill (wife of A. Claude), Kitty Hill (daughter of L. Claude Hill and niece to Bernard R.) and Mr. A.D. Sever (seated on railing). Seated are Mr. Bernard R. Hill and his daughter, Winnie Hill directly in front of him with his wife Marian Hill beside her. This photograph was most likely taken at the home of Bernard Hill. 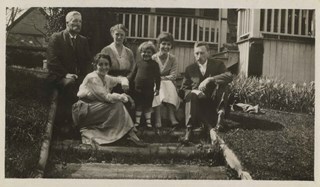 Photograph of members of the Hill family of Burnaby Lake. 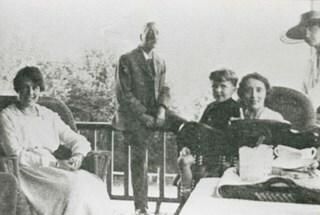 Left to right on back step are: Bernard R. Hill, his wife Marian Hill, Kenneth Hill (boy standing), Mrs. M.G. Hill and A. Claude Hill. Seated on front step is Maude Hill, wife of A. Claude. Photograph of Kenneth Hill standing on the front step of an unidentified home (probably Bernard Hill home). Photograph of Burnaby Winter Club's chief operating officer Len McNeely in Burnaby Winter Club's new ice rink. Note in black ink on recto of photograph reads: "3009 A Bby Mario 71% Bby pg ?" Photograph of a young couple sitting together on the steps to a house that appears to be Bernard Hill home on Douglas Road near Deer Lake. The couple appears to be Arthur Rowe and his wife Winnie Hill Rowe (daughter of Bernard Hill). There is a person standing on the patio in the background. 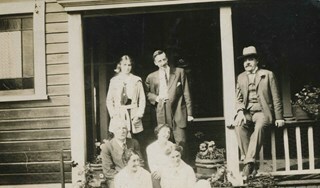 Photograph of people sitting together on the steps to a house. It appears to be the Bernard Hill home on Douglas Road (now Canada Way) near Deer Lake. There are four men, three women and one girl. 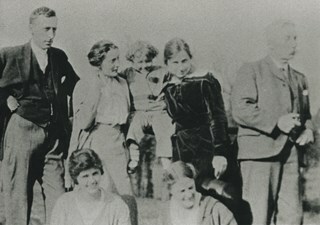 The couple sitting in the back to the right side of the photograph is Arthur Rowe and Winnie Hill Rowe (daughter of Bernard Hill). The girl in a sailor shirt and pleated skirt sitting in the front appears to be Kitty Hill. 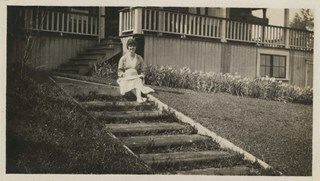 Photograph of a group of women sitting together on the steps to a house that appears to be Bernard Hill home on Douglas Road (now Canada Way) near Deer Lake. The three women, including Winnie Hill Rowe (daughter of Bernard Hill) on the right are sitting on the step just behind a girl in a sailor shirt and pleated skirt sitting in the front, who appears to be Kitty Hill. Photograph of a family having tea on the porch.There are two tables with tea and snacks, and some wicker chairs. An accompanying note in the accession file identifies the elderly man sitting on the rail as B.R. (Bernard Richard) Hill, and the man and the boy by the other side of the rail as Claude (son of Bernard Hill) and his son Kenneth. One of the women, unclear which one, is identified as "Maude's mother." 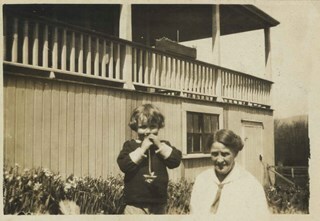 Photograph of a family having tea on a porch. There are three women and a young man who is sitting on a wicker chair. The women are pouring tea by the table. The location has been identified as the Bernard Hill family veranda. Photograph of the living room at Bernard Hill's house which was built in 1892 on Douglas Road, later renamed in part Canada Way. Prominent in the photograph is the wallpaper with floral motif and a piano with the top cluttered with vases, plates, framed photographs, etc. The piano stool has an antimacassar, and there is a chair to the left side. Also visible on the left side is a fireplace. This photograph is cropped and reproduced in Michael Sone's book, "Pioneer Tales of Burnaby," pg. 27. This portion of the interview pertains to Minard Gerald "Gerry" Hill's relatives in England, his father's early life as well as life on the strawberry farm in Burnaby. Recording is of an interview with Minard Gerald "Gerry" Hill conducted by Colin Stevens, February 9, 1978. Major themes discussed are: the Burnaby Lake Neighbourhood, Gilley Brothers Logging Company and his father, Bernard Hill. 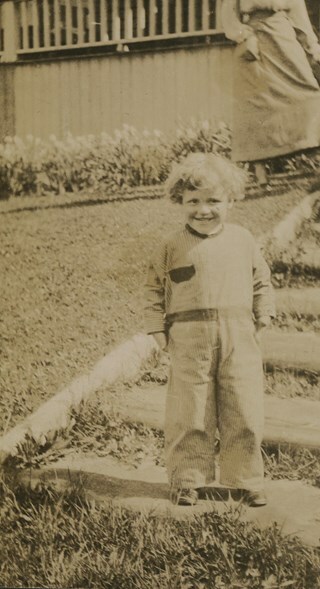 Minard Gerald “Gerry” Hill was born in Burnaby on July 31, 1893 to Marian (Berkeley) and Bernard Richard Hill. He was the youngest child in the family with older siblings Frank, Claude and Winnie. Bernard R. Hill was born in Bengal, India while his father worked for the East Indian Railway. He and his older brother Claude became strawberry farmers in Burnaby despite their years of training as engineers. Between them, the Hill brothers owned all the land between Burnaby Lake and Deer Lake where Deer Creek runs, and half way around Deer Lake. 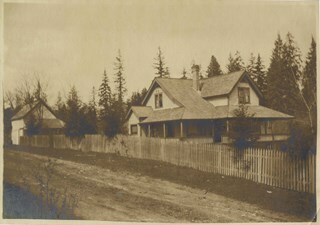 Bernard built his family home at Douglas Road near Deer Lake in 1892. After the decline in the strawberry industry, Bernard worked as a surveyor for the municipality. He also served as Burnaby Councillor and School Trustee. Gerry attended Miss Harriet Woodward’s kindergarten class, and went on to Edmonds School with Miss Ellen Lister as his teacher. He later went to Central high school in New Westminster, often on horseback. Gerry served in World War I, signing his recruitment papers November 9, 1914. When he returned home, he worked felling trees, then as an apprentice surveyor and finally as a carpenter. Minard Gerald “Gerry” Hill married Charlotte Elizabeth “Elizabeth” Vidal on September 28, 1920 and single-handedly built a house for him and his wife about a thousand feet from his parents’ home. He also bought property at Yellow Point, Vancouver Island around this time. By the early 1930s Gerry had moved to Yellow Point permanently and begun work building the lodge. Elizabeth and Gerry’s child, Richard Grant McEwan Hill was born at Ladysmith hospital. Charlotte Elizabeth “Elizabeth” (Vidal) Hill died February 11, 1984 at the age of eighty-seven. Minard Gerald “Gerry” Hill died January 30, 1988 at the age of ninety-three. This portion of the interview pertains to A. Claude Hill's memories of Christmas as a young boy, living in the Deer Lake area. He tells stories of the antics he got into with his brothers. Claude's wife, Marion Hill speaks encouraging words. Recording is of an interview with A. Claude Hill and his wife Marion Hill, conducted by Colin Stevens, November 7, 1977. Major themes discussed are: Christmas traditions and his Deer Lake neighbourhood. Claude Hill was born in England about 1885, the eldest son of Marian (Berkeley) and Bernard R. Hill. His younger sibling were Frank, Winnie and Minard Gerald “Gerry.” Claude Hill was named after Bernard’s older brother, Louis Claude Hill. Claude's father, Bernard R. Hill was born in Bengal, India while his father worked for the East Indian Railway. He and his older brother Uncle Claude became strawberry farmers in Burnaby despite their years of training as engineers. Between them, the Hill brothers owned all the land between Burnaby Lake and Deer Lake where Deer Creek runs, and half way around Deer Lake. After the decline in the strawberry industry, Bernard worked as a surveyor for the municipality. He also served as Burnaby Councillor and School Trustee. Bernard built his family home at Douglas Road near Deer Lake in 1892. 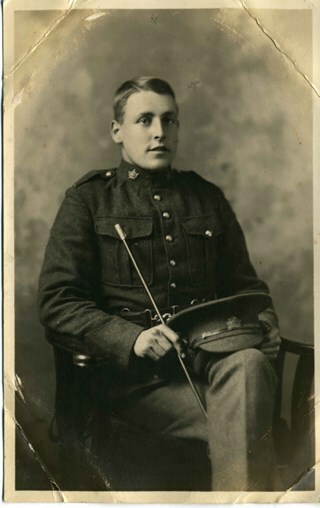 His oldest child, Claude was seven years old at the time and his first years of school in Burnaby were at Douglas Road. 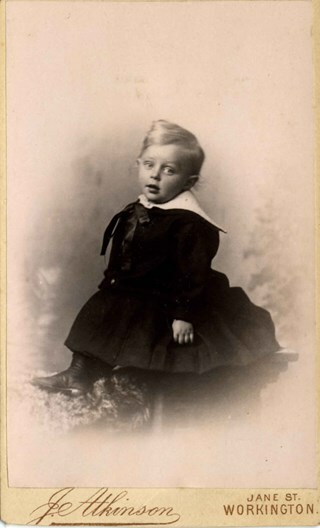 Later, Claude rode a horse and buggy with his younger brother to travel to school in New Westminster. A.Claude Hill married Marion "Mamie" in his early twenties. This portion of the interview pertains to A. Claude Hill's memories of how his father cleared land to build a house, including the equipment that was used. Photograph shows a wood house, identified as Bernard Hill's home, situated beside a road identified as Douglas Road. 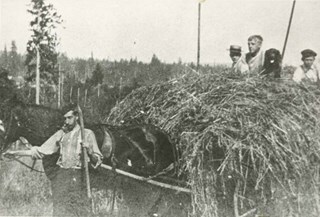 Note in pencil on album page reads: "B R Hill Home - Douglas Road, near Deer Lake / 1910 Burnaby"
Note in blue pen on verso reads: "B R Hill home / Burnaby"
Photograph of the Hill brothers Frank, Claude and Gerry and their pet dog riding on hay wagon on their father's farm. 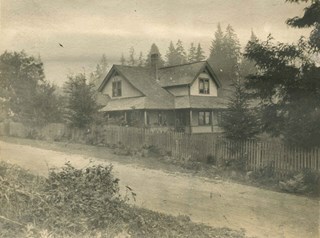 Photograph of the house belonging to Bernard Hill in the Burnaby Lake area on what is now Canada Way. Douglas Road runs through the foreground. Photograph of three boys and a dog riding on a mound of hay on a wagon. There is a man leading the horse pulling the wagon. This photograph was reproduced in Michael Sone's book, "Pioneer Tales of Burnaby," pg. 31. The caption reads: "Hill brothers and pet dog hitching ride on hay wagon on father's farm. Chap leading horse is probably remittance man often hired in those days." The description for photo 204-789, a cropped copy of this photo, identifies the boys as the Hill brothers Frank, Claude and Gerry and their pet dog riding on hay wagon on their father's farm. Photograph of a large gathering of people, men, women and children, in fine dresses and suits by a house with a picket fence. An accompanying note in the accession file identifies the photograph as taken on "sister's wedding" (possibly Winnie Hill Rowe) waiting to go into reception at B.R. Hill's (Bernard Richard Hill) house. Photograph is photogravure on paper of a house on the side of a path. The area appears wooded. The inscription and the accession register identify the house as the residence of Mr. and Mrs. B.R. Hill on Douglas Road, built about 1892, with an addition to the house built about 1905. Photograph of the fields and farmland looking southeast from the home of Bernard Hill down Douglas Road towards Deer Lake Brook. In the foreground view can be seen what is the present-day Kensington Avenue freeway entrance and No. 1 Firehall site on Sperling Avenue. The cabin that can be seen to the left in the background is an unknown residence further along Douglas Road near Rayside Drive and the cabin that is just visible in the centre background of the photograph (between treeline split) belonged to Mr. Nicholson. It was later torn down when Bernard Hill's brother Claude Hill built his home, Broadview at that location. 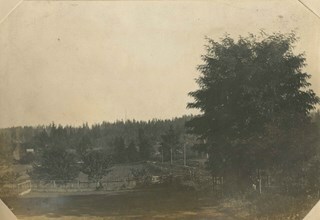 To the extreme right of the picture on the opposite side of Douglas Road is the property of Claude Hill's first Burnaby home also known as Brookfield (the current location of the Burnaby Village Museum). Photograph of a farmer driving a team of two horses mowing hay in a field. 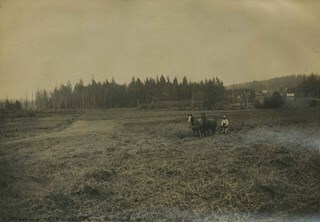 The photograph bears the caption "Mowing at Gaines' farm" and is accompanied by a notation in the album indicating that the field was across Douglas Road from Brookfield, the home of Claude Hill. This property belonged to Claude's brother Bernard Hill and was later known as 4990 Canada Way. The man is unidentified. In the background to the west can be seen Burnaby Lake and to the left the Pole Line Road (later Sperling Avenue) and to the right, Douglas Road and an unidentified house. This is the current location of the Kensington Avenue freeway interchange. 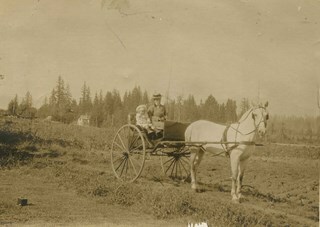 Photograph of Harriet Woodward with Kitty sitting in a horse drawn cart on the Hill family property known as Brookfield. The photograph is taken looking towards the northeast and Douglas Road can be seen in the background along with Bernard Hill's house (later 4990 Canada Way). In the foreground to the left, a box camera is visible sitting on the ground. inscribed in pencil, verso, l.l. "Looking down north Poleline Hill (now Sperling) Deer Lake at left. " Photograph looking north along the Pole Line Road (later Sperling Avenue). To the far left is Deer Lake and at the top right is Burnaby Lake. The smoke and debris from land clearing is a result of logging operations being carried out by the Doran Brothers logging company, the Deer Lake Mill Company. Above Deer Lake, Douglas Road is visible with Claude Hill's Brookfield property (later 6501 Deer Lake Avenue) on the south side of the road and Bernard Hill's home on the north side (later 4990 Canada Way). Just northeast of Brookfield is the George Clayton farm (amongst the trees) on what would later become the Henry and Grace Ceperley estate grounds known as Fairacres. The house in the centre of the picture is the Walker house (later 5255 Sperling Avenue). Mountains can be seen to the north.